Cold Water Bath – This is a great option if you find you ran out of time and forgot to put it in the refrigerator. Simply take the packaged turkey and put it into a sink or large pot full of cold water. It will defrost in about 1/4 of the time as the refrigerator. Be sure to change out the water every few hours or so to make sure the water stays cold. It should defrost in one day. TIP: If you are going to brine your turkey, it will thaw completely in the brine. So no worries! Is this helpful to you? Please be sure to “like” these posts and share them with your friends! 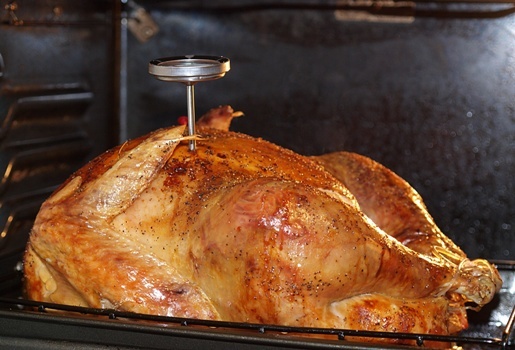 Do you remember the year you cooked a turkey for the first time? Please share your stories below! There are many first-timers this year who can learn from your mistakes as they (hopefully) laugh at their own! I did the same thing… leaving all the “extras” inside. I took out the neck but didn’t find the rest, so I thought they just didn’t put them in. I later found them “stuck” WAY up inside the bird… My In-laws were there and I was trying to impress my Mother-in-law.. OH, I impressed her, alright… I was so embarrassed . T he next year I looked!